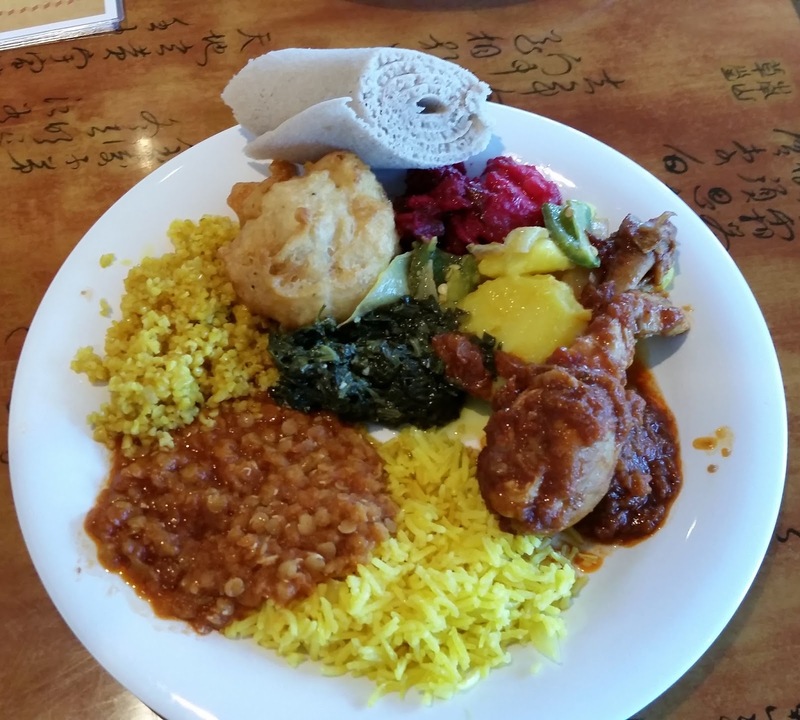 South Austin Foodie: Taste of Ethiopia + My 500th Blog Post! Taste of Ethiopia + My 500th Blog Post! This marks my 500th blog post! 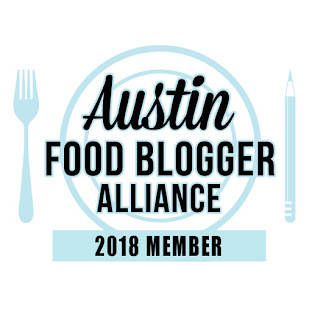 I have been blogging in South Austin since September 2008, and it's been interesting to see how social media platforms have changed the last few years, especially with the rise of Instagram. I strive for substance in my work, and will continue to provide honest feedback on the places I eat. Onward! 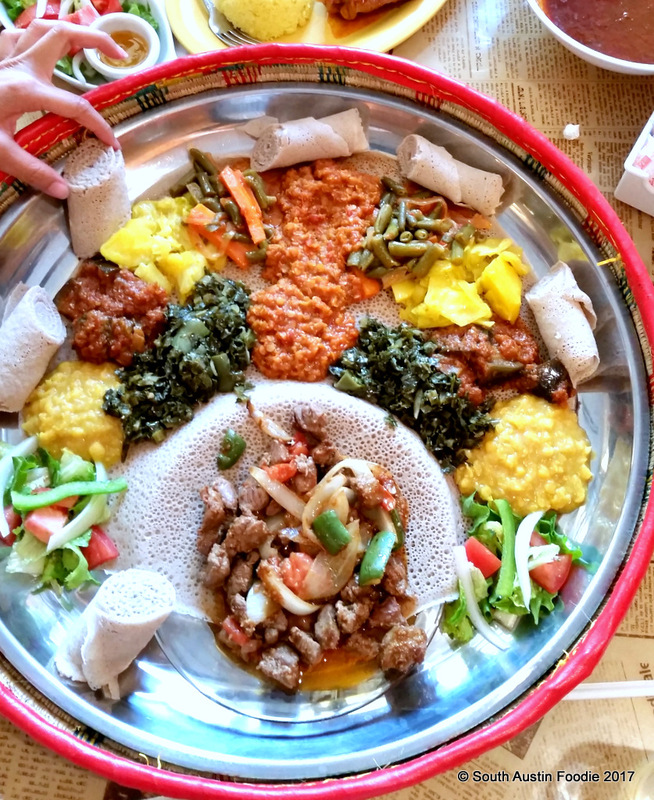 I have been to Taste of Ethiopia at 3801 South Congress Avenue twice in the past couple months; their other location is in Pflugerville. The first time was for lunch, where I had the lunch buffet and the second time was dinner with a group of foodie friends and we ordered off the menu, for a typical communal Ethiopian meal. I am hardly an expert in Ethiopian, though I have had it many times throughout the years. It's a great way to literally share a meal and expand your cultural horizons, and many vegetarian options (and I'd guess gluten and dairy free as well). 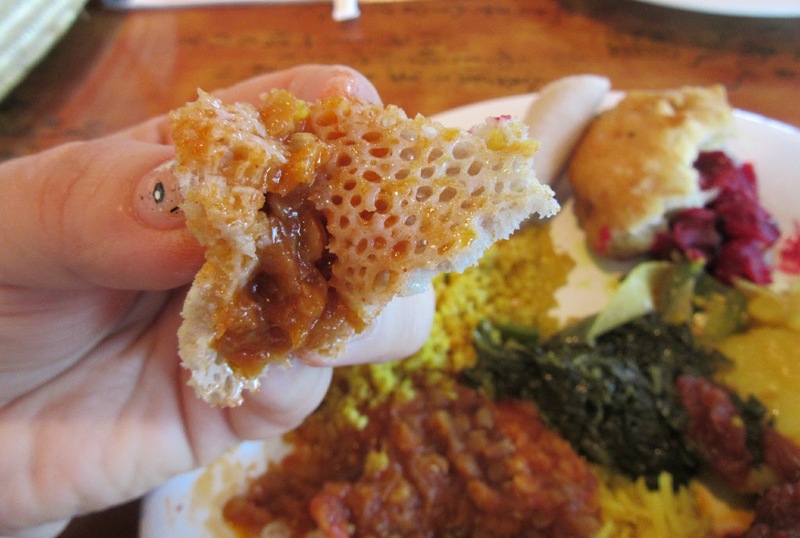 I found a blog, Uncornered Market, that has a good primer on the basics of Ethiopian foods. The interior of the restaurant is spacious and includes a bar area. 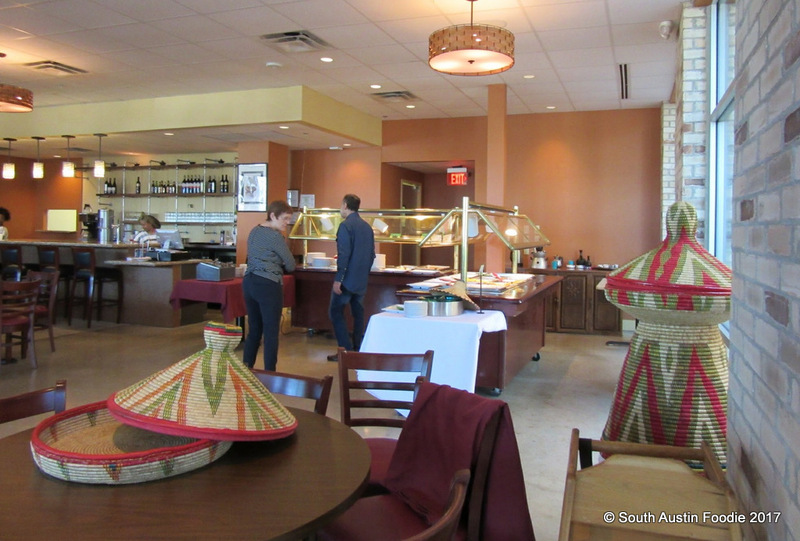 Most of the seating runs parallel to the windows along the South Congress side, and there are nice Ethiopian touches throughout, like these baskets, or mesob, that the food is served in. The lunch buffet is almost all vegetarian, with a variety of lentil, vegetable, and rice dishes. I think this doro wat chicken dish was the only meat item on the buffet. Doro wat is chicken simmered in berbere spices, which can include savory ones like chile and fenugreek and sweeter notes such as cardamom, cinnamon and clove; like curry powder each family has their own recipe! I love the flavor of the chicken! The roll at the top of the picture above and what's in my hand below is called injera, and it's the tortilla of Ethiopian food. Made from fermented teff flour, it has a spongy texture and also a lightly fermented flavor; I totally dig it, but not everyone does! Typically in Ethiopia, you eat with your hands and can use in the injera to help scoop up your food. Now I am entirely curious to know what injera would be like if toasted like tortilla chips! I may have to get some extra on my next visit and try this at home. And from reading the Uncornered Market referenced above, as in India, it's considered impolite to eat with your left hand. I will say I only ate with my left hand for this picture so I could use the camera with my right hand. Apologizes if I offended anyone! 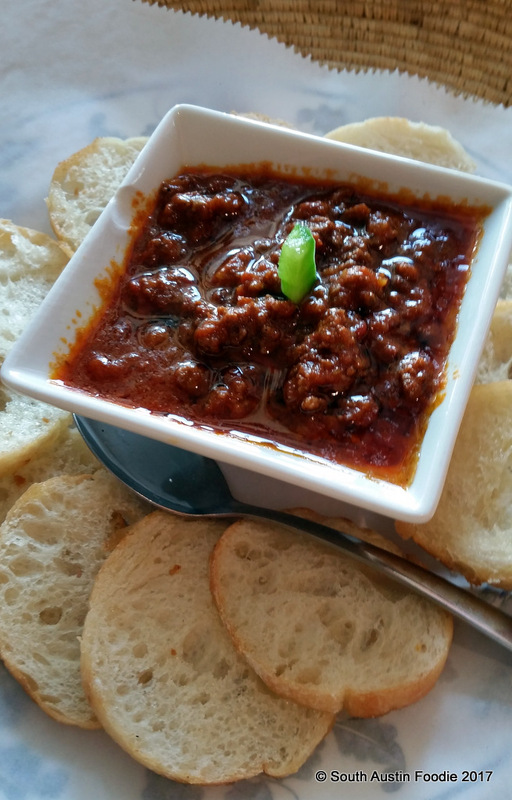 This appetizer from our dinner visit is called minchet abish, and it's finely chopped beef, seasoned with spices (garlic, ginger, cardamom), sauteed in berbere sauce and served with bread. A touch oily, but I really enjoy the flavor. If you take a look at the photo at the top of this post, you'll see the lamb tibbs on the platter at the 6 o'clock position, and items from the veggie sampler arranged around the platter. These included gomen (collard greens), two different lentil dishes, tikil gomen (cabbage), and fesolia (green beans + carrots). They bring an empty platter and place it in the mesob basket with some injera as the base layer, and they they spoon the lamb and other vegetable dishes onto the injera, leaving some rolls of fresh injera behind for eating with. It's a fun, communal way to eat. The lamb and lentils were my favorites. 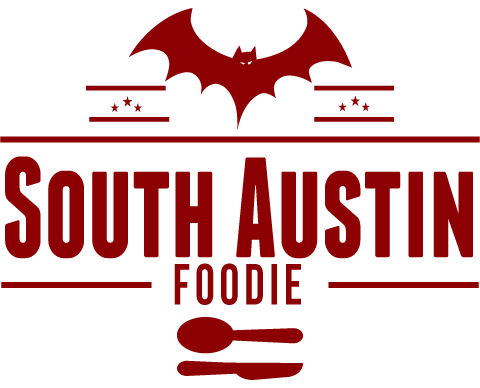 Both times, the service has been warm and friendly, and the staff is happy to answer questions about the food, which they are very proud of. They will also bring forks upon request. Again the meat and lentil dishes have been my favorites, and there's a few more on the menu that I'd like to go back and try! Just a note about parking: there is space available behind the building, turn east on Alpine and then an immediate right into the parking lot, up the hill. When I was there for lunch, there was no problem parking there. For dinner on a Saturday though, the lot was completely filled at 6 pm. I kind of think a lot of the spots were being used by people at the apartments there, because neither the restaurant nor the rest of the complex was all that busy. From the parking lot, there's a wall sign indicating stairs, but things are not well-marked. The door closest to the stair sign was the first I tried, and it was unlocked, but it lead directly into the residential area and I am guessing this door shouldn't have been unlocked. The next door I tried did lead to a stairwell, which does lead to the street level, and the restaurant is straight ahead on the right when you exit the stairwell. It would be nice if the property management company marked things better! Let's just say I was glad it was daylight when I first went. Congratulations on reaching such an awesome milestone in blogging!